Pizza is a funny thing. Most people love it and would say it’s their favorite thing ever in the whole world! And there are a few who actually don’t like it. What’s left is someone like me. I like the idea of pizza, but prepackaged, sugar-laden sauces, cheap cheese and mile-hi crusts don’t do it for me. 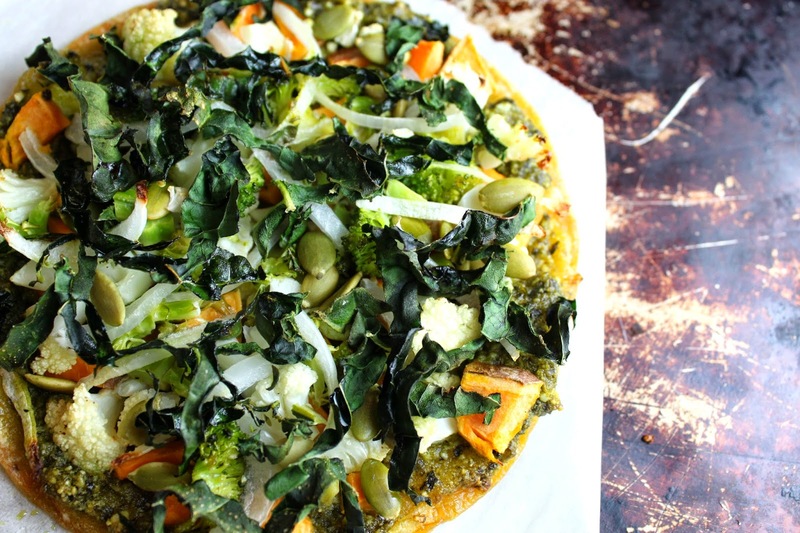 A thin crust, loaded with veggies and bursting with flavor sauces are more my style. One of my most popular cooking classes is my Grilled Flatbread class. But the grill is not always accessible (especially if it’s covered under 19″ of snow! ), and sometimes you need an even quicker back up. Enter the tortilla. Tortillas aren’t just for tacos anymore. I’ve been making pizza crusts out of them for years, and it’s time you started, too. It’s the same principle: lay out the crust, add toppings and bake. Voila! A tortilla pizza. And because the tortilla is just right for a single pizza, everyone gets to top it their way. So if you have a Wisconsinite in your house who has sworn an oath to eat cheese on EVERYTHING, now they can have cheese and you don’t have to. Let’s talk about the Kale Lime pesto. It’s amazing as a dip, on top of pasta, as a spread in sandwiches or a little meatball sauce. It gives life to your roasted veggies and works perfect as a pizza “sauce.” I also enjoy it straight on a spoon. 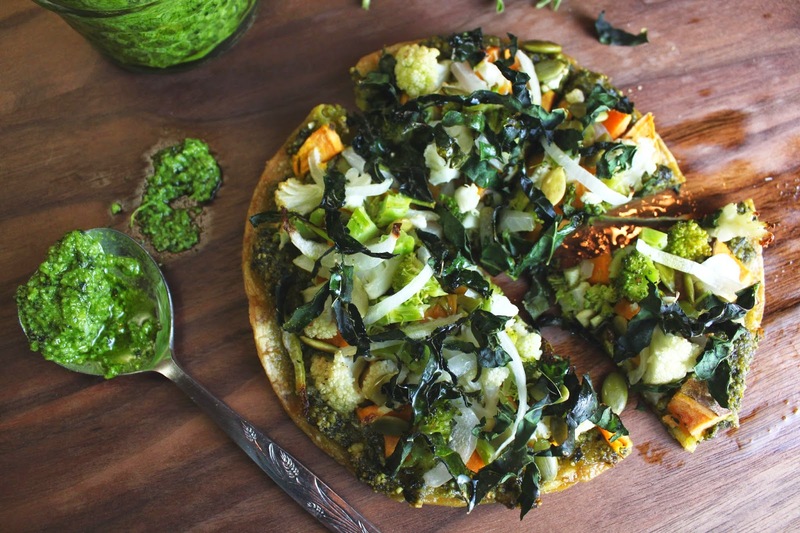 Having a go-to pizza in your repertoire is now as simple as it is healthy. Mangia! Roast the vegetables (expect for the kale): preheat the oven to 425 degrees. Chop the veggies into bite-size pieces. Cover a sheet pan with parchment paper or tin foil, add the vegetables and toss with 1 tablespoon olive oil. Add a pinch of salt and pepper. Roast in the oven until crisp and tender (about 10 minutes). Lay the tortilla on a sheet pan. Spread with the kale lime pesto. Top with the vegetables, including the kale. Place back in the oven until the tortilla is crispy. Remove from oven and add a small drizzle of olive oil. Slice and enjoy. Place all the ingredients in a blender and blend to combine. If you feel the pesto is too thick, add an additional drizzle of olive oil. 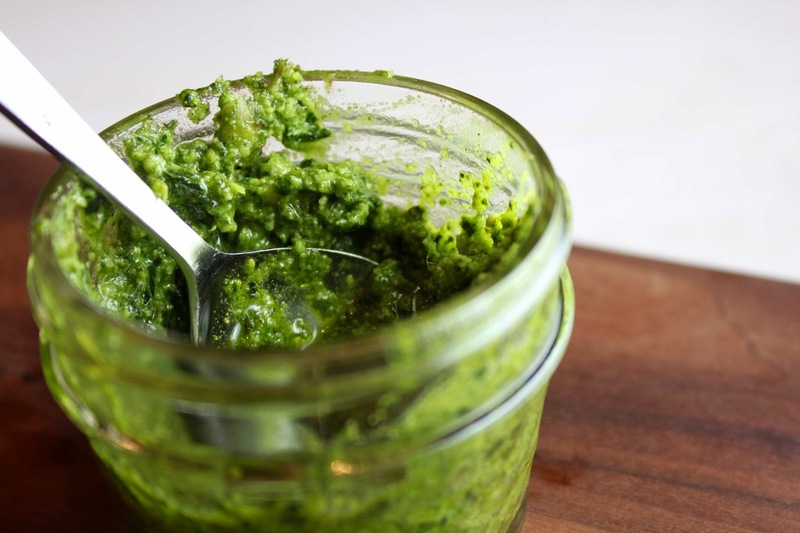 Happy Healthy Tips: Making a pesto out of kale increases the nutritional value tenfold. In addition, there is no cheese to contend with. Just antioxidants with a kick of fresh lime.